Kuala Lumpur (VNA) – Vietnam stayed at the third place on the medal tally at the end of its 10th day into SEA Games 29 in Kuala Lumpur, Malaysia, which ended on August 31. The country recorded 58 gold, 48 silver, and 55 bronze medals. Pencak silat was the highlight of the day, with the team adding three gold medals to Vietnam’s stock and completing its quota set for gold medals at the games. The results were attributable to outstanding performances of pencak silat martial artists Pham Thi Tuoi (tanding [combat] women’s 50kg), Nguyen Duy Tuyen (tanding men’s 75-80kg) and Nguyen Van Tri (tanding men’s 90-kg). 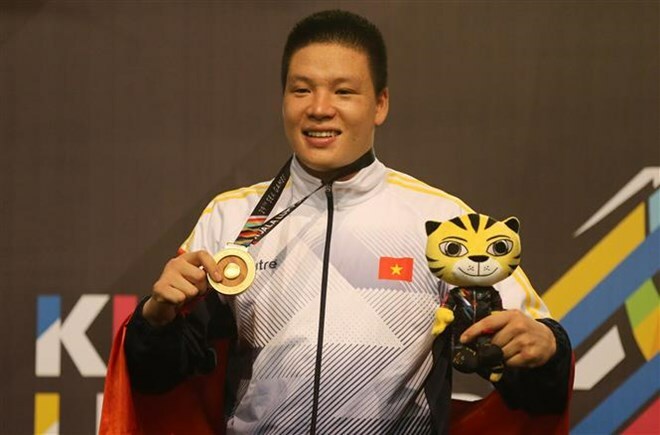 The same day, Vietnamese taekwondo artist Nguyen Van Duy earned a silver medal, while weightlifter Nguyen Hong Ngoc came second in men’s under 77-kg event with an overall 307kg lift, winning another silver medal.